When I was 25, I went on holiday with my boyfriend to Cinque Terre, a protected marine reserve on the Italian Riviera. The relationship was not a good one, and the holiday was not a seamless week of intimacy. However, one memory will always stay with me. We were on the beach, arguing about some triviality, and my parting shot was to walk away in a huff and dive into the sea. A couple of minutes later, my mood had changed completely. Treading water in a clear, azure Mediterranean, craggy cliffs surrounding me, I felt a wonderful sense of wellbeing. As I swam further out and immersed myself in the salty water, this sense of contentment got stronger. By the time I returned to the beach, I couldn’t remember what the argument was about – let alone care who had won. My experience was, I have subsequently learned, far from unique. Triathlete and personal trainer Daniel Parnwell ranks swimming in outdoor lakes and rivers as one of life’s most pleasurable experiences. One of the highlights of his next triathlon will be the 2km swim in Lake Verney in the Swiss Alps. Swimming’s therapeutic qualities aren’t limited to the sense of wellbeing that comes from being outdoors, either. Despite the chlorine, there’s a certain feel-good factor that comes from swimming in a pool. For Anna Goldrein, an online travel journalist from London, it’s all about what she describes as the meditative quality of swimming. Swimming can be even more relaxing if you learn the proper technique: graphic designer-turned-swimming teacher Karen Wilson teaches people to swim using principles drawn from the Alexander Technique, such as paying attention to body alignment in the water and breathing correctly. There’s another advantage of water exercise. When you’re working out in the gym, everyone can see you. But in a pool you become virtually invisible, so you’re not self-conscious. Charlotte Maurissen is a professional triathlete-turned-personal trainer. 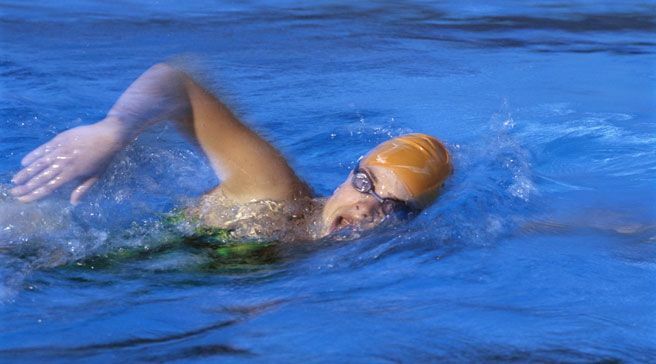 She finds swimming particularly useful for new clients who don’t have an established exercise routine. Aside from exercise, why does being in water make us feel so good? Much has been made of the amniotic qualities of being in water – its similarity to being in the womb is one possible explanation for why we feel so well after a swim, especially in the sea. The beneficial qualities of sea water have been observed for many centuries. In about 500BC, Hippocrates, the father of medicine, was the first to record its therapeutic qualities when he noticed the healing effects of sea water on the injured hands of fishermen. The sea water not only reduced infections, but patients who followed treatments involving the use of sea water found that it promoted pain relief. It’s also believed that our bodies have the ability to absorb minerals, such as iodine, from the sea through the skin, and to release toxins back into the water. This is the principle behind thalassotherapy, a system of bathing in sea water (‘thalassa’ is Greek for sea). It’s employed to treat problems such as lack of sleep, poor circulation and cellulite. Water is so much more than a simple medium for exercise. Alexander McQueen, the late fashion designer, was quoted in Vogue as being ‘happiest when he was scuba-diving’. Underwater, he could be like Peter Pan, untroubled by the issues that plagued him on dry land. It’s a sentiment that all swimmers and water babies can relate to.